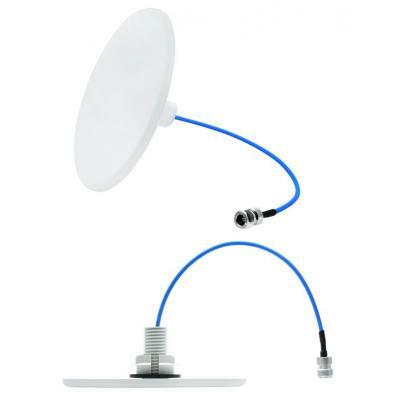 The CFSA35606P/CFSA35606P1 is a low PIM indoor wideband omnidirectional low-profile ceiling mount antenna. It is designed to provide pattern coverage that is optimized for indoor coverage requirements at 350-520, 600-960, 1350-1550, and 1690-6000 MHz for the UHF, 4G LTE, 2G/3G Cellular, UMTS/AWS-3, CBRS, and the Wi-Fi frequency bands. The CFSA35606P/CFSA35606P1 are applicable for environments where aesthetics and wide-angle coverage are necessary for successful wireless deployment. The surprisingly small size and extreme low profile enables maximum mounting flexibility while maintaining desired in-building aesthetics.